This paper aims to assess the face stability for tunnels excavated in weathered and saturated rock masses using the Hoek-Brown failure criterion. With resort to the upper bound theorem of limit analysis, a 3D rotational failure mechanism is constructed in which the rate of work done by pore water pressure is calculated as a part of external work by introducing the pore water pressure coefficient. To verify the validity of the proposed approach, comparisons with the previous studies are performed considering the case of Mohr-Coulomb failure criterion. Subsequently, numerical trials are done to investigate the nonlinear responses of the normalized critical support force against tunnel face based on the Hoek-Brown failure criterion. Accordingly, several normalized design charts are provided for a quick assessment of tunnel face stability. 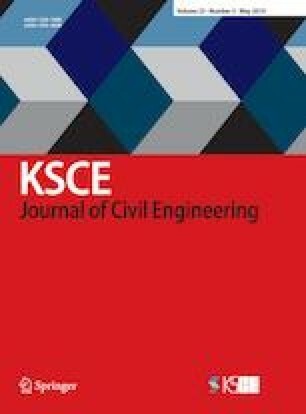 To further improve the proposed approach, the main error sources are discussed as a reminder in engineering application which is followed by the candidate schemes reported by other authors. The merit and demerit of these schemes are roughly described for reference. Conclusively, the proposed approach is tightly linked to practical engineering and provides more reliable assessment of tunnel face stability below water table without much expensive numerical simulations. Yang, X. L. and Zhang, S. (2019). “Seismic active earth pressure for soils with tension cracks.” International Journal of Geomechanics, Vol. 19, DOI: https://doi.org/10.1061/(ASCE)GM.1943-5622.0001414.